Tonight the Lord put on a grand display of His creation, as the earth passed in front of the moon. The red colour (a blood moon) is caused by some light from the sun filtering through the earth's dusty atmosphere - pollution can be a little bit pretty then! 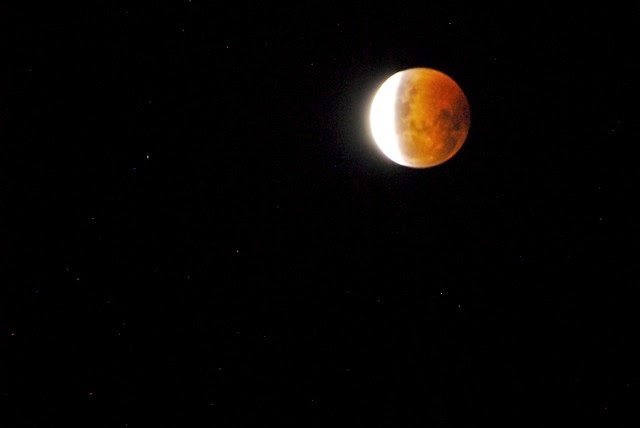 I snapped this photo with a 300mm lens around 11 pm, after first rousing Aaron to see the event. All I got from Caleb was a big hand in front of his face and "NOOOOO" to my question, "do you want to see the eclipse?". I had taken note of the biggest gap I think there has ever been in your blog and started to worry! Glad to see you "back"! We did see Saturn, complete with rings, through the telescope about 2 weeks ago. Fantastic!